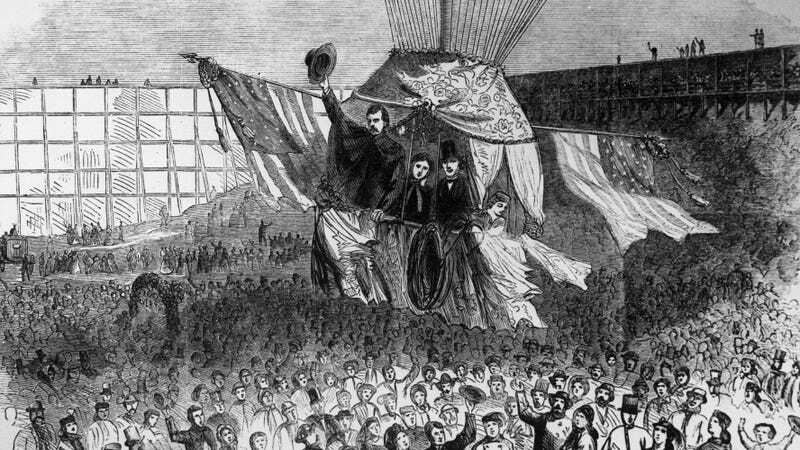 Trendy Nineteenth-Century Wedding Theme: Hot Air Balloons! Flip through any wedding magazine, and you’ll find yourself shaking your head at the stunts people will pull to feel special on their big day. But it’s not a new phenomenon. Take, for instance, Mary West Jenkins and Dr. John F. Boyton, who decided to get married in a damn hot air balloon over Central Park, in 1865. For some days the curiosity-loving portion of the New-York public have been all agog with the latest sensation — a projected marriage in a balloon. This extraordinary event promised to be fully as exciting as the famous, “Diamond Wedding,” or even the Tom Thumb nuptials, for there was something peculiarly novel, not to say ridiculous, in the idea of a wedding taking place amid the clouds, with all mundane witnesses shut out by fleecy vapors, and the epithalamium sung by the rattling cordage of the aerial ship. The ladies naturally evinced considerable interest in the details of the affair, and yesterday they seemed determined to satisfy their curiosity to its full extent. The balloon rose, glided upward beautifully, and as the sea-breeze caught its silken sides the aerial craft bounded up almost instantly to a height of some thousand feet, when it again drifted, sailing slowly over the Central Park toward High Bridge. The setting sun gilded the globe of the balloon into splendor, giving it the appearance of a golden ball. An hour and a half later, they landed in Mount Vernon, New York, the knot tied. Unfortunately, their officiant wouldn’t do the ceremony itself in the air, so they had to settle for signing the contract above ground. The Times says that the majority of the crowd was all right with this turn of events, and it certainly didn’t stop the splashy coverage in Harper’s. But technically, it wouldn’t be until October 1874 that an American couple managed to get their ceremony off the ground. Surprise, surprise—the feat was achieved in a balloon called the P.T. Barnum, and the happy couple both worked for Barnum. Of course, nowadays, hot air balloons are such a popular spot for marriage proposals that The Knot had to warn people to think twice before trying it. And sure enough, marrying in one is still eye-catching enough to get you some local media coverage. But is it even worth bothering if you can’t recapture that early Industrial Age enthusiasm?